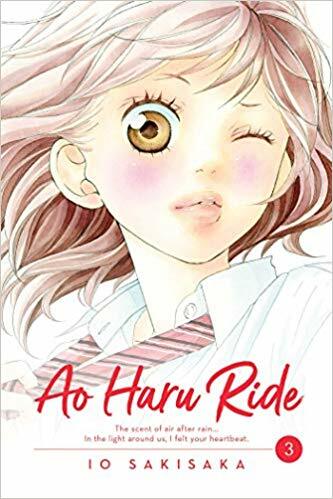 Ao Haru Ride volume 3 (Shojo Beat/Viz) continues the strong start to the series from the first two volumes. Futaba finally acknowledges her feelings for Kou - the current Kou - and no longer pines for the lost Kou from middle-school. However, since Yuri confided in Futaba that she too likes Kou, Futaba must decide whether to stop pursuing him or tell Yuri of her feelings as well. This sets up the central drama and character growth of the third volume. This is skillfully handled and we get a beautiful middle ground between this interaction between Futaba and Yuri being no big deal and being a huge overly-dramatized situation (what would have happened in most series). Instead, Sakisaka-sensei's deftness for writing nuanced characters and emotionally-sensitive moments comes through so powerfully in this volume. Not only is the Futuba/Yuri storyline done with delicacy, intimacy, and a touch of sadness, we also start to get greater glimpses into Kou and Shoko (a side character). With Kou, we see him struggling to want to connect, whether it is with Futaba, or with Kaminato (who comes to his defense in a scene that confirms his good-guy qualities). Kou even opens up a bit to Futaba and others, making some significant statements that reveal an inner sadness momentarily before he waves them off as jokes. Also, like the last volume, Kou comes tantalizingly close to acting on what we hope are brewing feelings for Futaba, before ultimately refusing to allow himself to go down that path. With Shoko, a side story gives us some of her background, but we also see her true (kind) character in the moments after Futaba finally tells Yuri about her feelings for Kou. Without giving anything away, the awareness, empathy, and skill with which Shoko supports both her friends is incredibly touching and well written. I know I'm gushing, but the truth is, this series so far represents everything I love about the best shoujo. The characters are nuanced, the writing is emotionally astute, the story is complex without being overly-dramatic or using unrealistic situations to create movement. It is one of the best written series out there. More than great writing, great characters, and a great story so far (as if that isn't enough), it also has extraordinarily beautiful art. The characters are so well defined, the lines are precise but soft, and (my favorite thing of all) there is gorgeous and complex use of screen tones that adds so much depth and grace to each panel. To see an example of this, just look at the intro drawing of Yuri from Chapter 11. The gray screentone around the stars, the way it blends into the shadowing of her left eye, the layers of circular screens at the bottom. And every page is like this! Really, I don't know what else to tell you. Do you like shoujo manga? Do you like really well written manga? Do you like well written characters, emotionally intelligent writing, plot driven by subtle every-day things? Do you like great art? Do you breathe? If you answered "yes" to any of those, then you will love Ao Haru Ride v. 3. This volume, given how many incredible yet delicate moments there are in each chapter, gets a 9/10! If you've read any of my other manga or anime reviews, you know I don't give a score like that out lightly. This is a must-read series.